I often warn about the significant dangers of glyphosate — better known as one of the main ingredients in Roundup®. It’s sprayed on genetically modified crops, intended to keep “weeds” away — but it kills anything else green in sight. In recent years, we’ve discovered that it’s also making its way into our food and water supply. And now, this pervasive, toxic plant killer has found its way into our beer and wine. In fact, a recent study by the advocacy group U.S. PIRG found glyphosate in 19 of the 20 beers and wines tested. It’s devastating news. Especially for those of us who enjoy the many health benefits of drinking beer and wine in moderation. Peak Organic IPA was the only brand of beer (or wine) that showed zero levels of glyphosate. So, if you’re a beer-drinker, I’d put it at the top of your list. Plus, the added hops for IPA taste has many of its own benefits. Next came Stella Artois beer and hard cider, Fat Tire Ale, Sierra Nevada Pale Ale, Guinness, and Heineken — all of which had relatively low levels. But Budweiser, Coors, Corona, and Miller all had significantly higher levels. Sadly, the more heavily advertised these “popular” beers, the worse the glyphosate contamination. For years, I researched and practiced toxicology (the study of poisons) as a forensic pathologist and a Florida State Medical Examiner. So, of course, I know the human body isn’t defenseless and can detoxify poisons in small amounts. But there is such a thing as a “dose-response” effect. And the higher the dose, the worse the poisoning effects on the body. So, be sure to stay away from those more mainstream beers — as well as Tsingtao. All wines tested were contaminated with glyphosate. But the worst offenders were Barefoot Cabernet, Beringer Moscato, and Sutter Home Merlot — all from California. The now world-famous Robert Mondavi Winery had just been established. And I remember there were dog paw prints in the fresh cement at the visitor’s center. Thus, the legend of “Vino” the dog was born. They told us that “Vino” loved to drink all the extra wine poured into the jug during the wine tastings. This gave the children something to entertain them while the adults enjoyed their samplings. Of course, these vineyards were established in the 1800s by French, Italian, Basque, and Swiss settlers from the old country. In those three California counties, they found the ideal conditions to grow and reproduce the classic varietal wines of Europe. In time, California wines became a big business, competing with red wines from Italy, France, and Spain, and then Chile, Argentina, and Australia. And California white wines began to compete with those from Germany and elsewhere around the world. Of course, these successful California wineries have since been bought by big food giants like Nestle, which began turning them into a “Disneyland for adults,” complete with gondola rides. So, the whole experience has lost its gentle, authentic flavor. And now, apparently, many of their wines are flavored with plant killer. Glyphosate also kills bacterial cells, including the healthy probiotic bacteria in your GI microbiome. And we now know the microbiome is crucial for optimal digestion, the immune system, and the healthy functioning of your brain and body. In addition, many experts now blame the epidemic of food intolerance, supposedly due to “gluten sensitivities,” on GM wheat products polluted with glyphosate. Because of its burgeoning use on conventionally grown crops, glyphosate is now found in rainwater. Which causes cross-contamination from crops grown with glyphosate onto organic foods grown nearby — or even miles and miles away. In fact, I’ve spoken personally with small-scale, co-op farmers who use strictly organic practices. But now they’re seeing their bee colonies succumb to glyphosate drifts from other farms. So, it’s not all that surprising that even an organic winery called Frey Vineyards was found to contain glyphosate in its wine. Frey has never used pesticides on its vineyards or in any of its agricultural practices. In addition, the researchers found glyphosate in a 2016 organic Inkarri Malbec wine and a 2017 Samuel Smith Organic Lager beer. 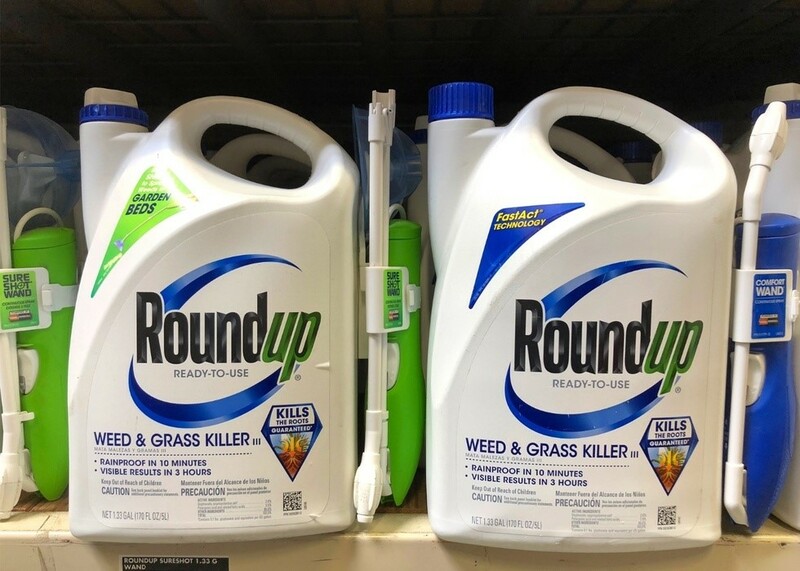 In my view, we’re basically allowing Monsanto (now Bayer), the makers of Roundup®, to conduct a dangerous, uncontrolled ecological experiment with this poison that’s accumulating in the Earth’s soil and water. And it’s an environmental disaster of global dimensions. But there’s plenty of convincing science saying otherwise. No wonder Bayer’s stock is taking dramatic plunges since its acquisition of this Monsanto mess! So, for me, I’ll just go back to drinking the wines from France and Italy — where big business isn’t allowed to poison the public, and where they take the health and quality of their food and drink seriously. P.S. While there might not be pesticide warning labels on alcohol, there are things you can do to avoid unnecessary, harmful chemicals — and choose the cleanest, safest, healthiest foods for you and your family. I wrote about this approach extensively in the July 2018 issue of my Insiders’ Cures newsletter (“Looking beyond labels”). Subscribers can log on to www.DrMicozzi.com with their username and password to read the article — and my entire archive. Not a subscriber? Not a problem. Click here to learn more or sign up today!